Wi-Fi networks were originally built with coverage in mind and access points were installed in rooms where it was known to need Wi-Fi. But as businesses began migrating from Ethernet to a complete Wi-Fi only infrastructure, this made Wi-Fi a mission critical service to business objectives. In the bustling city of San Francisco, a tech-centric business relied on Wi-Fi for all operations, including accessing the cloud. Uploading and downloading traffic patterns began slowing down Wi-Fi. To help increase productivity and take advantage of the investment made into the WLAN infrastructure, we helped plan and design a WLAN where end users saw an increase in performance, reliability, and their experience increased dramatically. 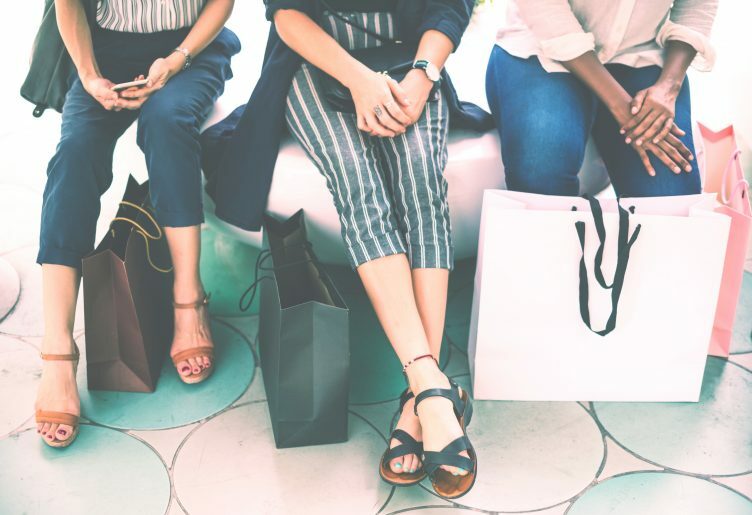 We outline 6 characteristics of high performing WLANs which do away with frustrated end users and get the business back on track to productivity. You give your finger a quick lick and put it up in the air. Then you turn to your installer and point to randomly selected areas of the ceiling and say, “Put a WAP here, one over there, and one right here and we should be good..” This is a recipe for disaster. To deploy a high performing WLAN, in which your workforce heavily relies on, requires more than guess work. It requires a proper design which begins with gathering requirements. When it comes to upgrading the core network, Wi-Fi must be treated the same. Treat Wi-Fi as an extension of your wired network. 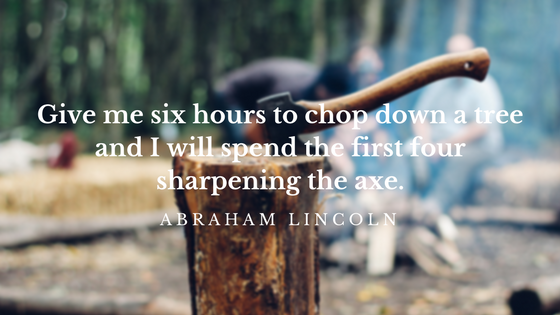 Design is the result of thorough planning. It requires understanding how the WLAN will be used, what devices will be utilizing the WLAN, how many devices, and what applications. This is not an exhaustive list of questions but it’s a good starting point. The end result of planning and design will be a WLAN built for a productive end user experience. Packet6 can help with the planning and design of your next generation WLAN. Planning upfront will lay the foundations to a WLAN designed to fit the business needs. A WLAN must be designed for a mobile workforce. The technical professional must have in-depth Wi-Fi knowledge and understand the knobs required to tune for the specific environment. A high performing WLAN will be designed so that there are less trouble tickets. It will be designed on the capability of the devices utilizing the WLAN, the capacity needs of the environment, and for high density of devices. Accessing information quickly and easily on any wireless device drives the mobile workforce. Wi-Fi is now the primary access. Businesses have been migrating from Ethernet to an all wireless infrastructure. That means the WLAN infrastructure must be reliable. Redundancy builds a robust WLAN infrastructure to prevent major outages. It prevents loss of productivity and loss of potential revenue. Ensure the WLAN is built with good backend infrastructure. A reliable WLAN must be capable of adapting to the radio frequency environment. It must react to adverse effects from neighboring WLANs. Interference is another productivity killer which a WLAN needs to identify and mitigate. With workforces placing an abundant reliance on cloud applications, maintaining a reliable WLAN is key to boosting business growth. Mobile data traffic grew 63% in 2016, according to Cisco. There’s no avoiding the penetration of IoT devices as they take the enterprise by storm. It leaves many wondering how to secure IoT devices and their WLANs. IoT may help drive innovation but data must be kept secure and unauthorized access needs to be thwarted. A high performing WLAN must allow trusted devices to authorized data. Properly segmenting these networks is just one of many steps. A WLAN system must identify rogue access points and devices with a method of containing those threats quickly. In 2007, TJ Maxx had a cyber security breach of their credit card data because of weak Wi-Fi security. Don’t become the next headline. In today’s workplace, everyone is accessing the cloud at all times. Wi-Fi is now the primary method of access to network resources. People are carrying up to 3 or 4 devices at a time and needing to get their work done from any of those devices. To provide a boost in productivity and effectively collaborate with others, slow or unresponsive Wi-Fi must be eliminated. A well performing WLAN always goes back to reliability. An increase in reliability boosts end user productivity. Users can perform their work efficiently and from anywhere in the office. Voice calls are often done over Wi-Fi calling due to a lack of LTE signal penetration into the building. Video conferencing and streaming is putting a strain on the WLAN as well. Plan for these workloads. The quality of the users work over Wi-Fi can be directly matched to the reliability of the Wi-Fi network. As people begin working in the office at early hours, the Wi-Fi network will be humming. As more people begin to fill in their seats some start noticing a degradation of Wi-Fi service. The increase in number of devices creates a high density situation. With each person carrying 3-4 devices can put a strain on the WLAN. The types of applications used on each of these devices defines how well a Wi-Fi network will perform. If it was designed according to requirements, it will perform as expected. Without planning for capacity equates to planning for failure. Other factors must be taken into consideration. In addition to planning for capacity, APs must be mounted properly and antennas aligned in the right direction. It is all based on the usage and capacity requirements of the work patterns. 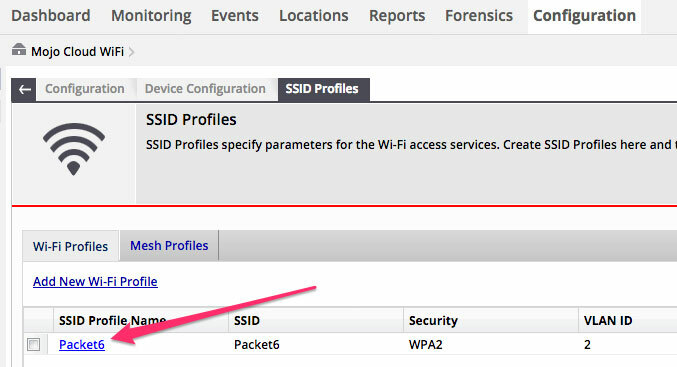 How do we know if a WLAN is performing? Is the IT support staff armed with the right tools to understand the state of the Wi-Fi network. 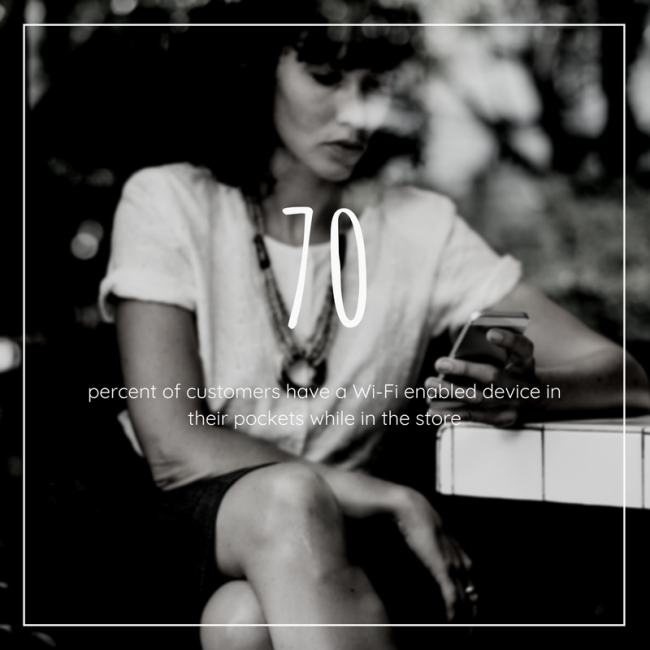 Analytics can provide valuable insight into how the Wi-Fi network is being used and to what capacity. This information can lead to optimizations for increased end user experience. Analytics can also empower the IT support staff to troubleshoot quickly when issues arise. 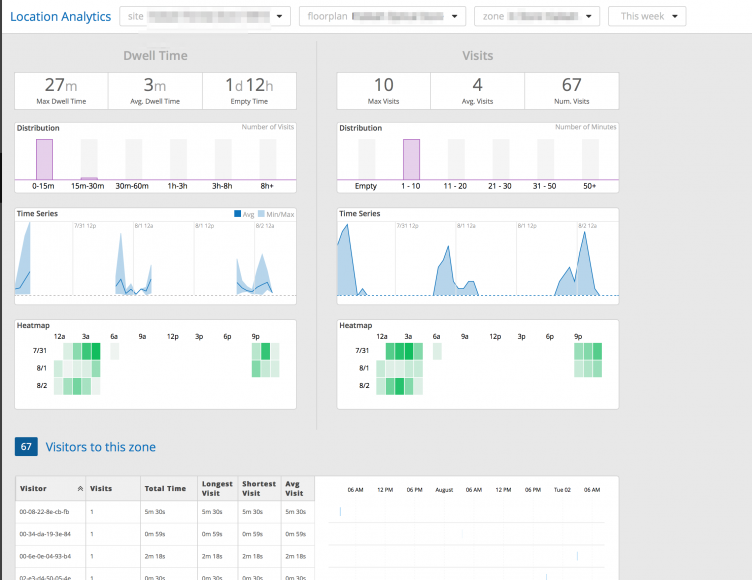 The data lends itself to measuring end user experience across an entire network stack. With powerful information on-hand it can improve root cause analysis, decrease length in time spent during the investigation process, and improve time to resolution. Wi-Fi networks are more complex than ever. The 6 characteristics are; starting with a plan and design based on requirements of the business and end users, reliability to ensure devices can connect when they need to, security – which should be thought of starting from the beginning of the design, Wi-Fi networks should provide a good end user experience and less frustrations, built for capacity as more devices are brought onto Wi-Fi, and should be monitored to investigate any issues, find trends, or to be proactive. Located in the historic Herbst Pavilion in prime San Francisco Bay waterfront, the San Francisco Art Institute (SFAI) opened a new campus at Fort Mason Center. The Fort Mason campus is home to over 160 art students and faculty in a large 67,000 square foot space. There is 4,300 square feet of exhibition galleries which is open to the public, 160+ artist studios, performance spaces, a student lounge, multipurpose teaching spaces and staff offices. SFAI transformed the Fort Mason building on Pier 2. Previously it housed pieces of crates and trash. At one point it used to house military supplies. $50 million later it is beautifully remodeled for SFAI graduate students. A building like this comes with its own set of technology challenges which is SFAI looked to Packet6 to deliver a modern Wi-Fi network with new network infrastructure. With SFAI bringing in new technology generations ahead of what they had on campus, they looked to Packet6 for the knowledge and expertise in Wi-Fi design, configuration, and deployment. 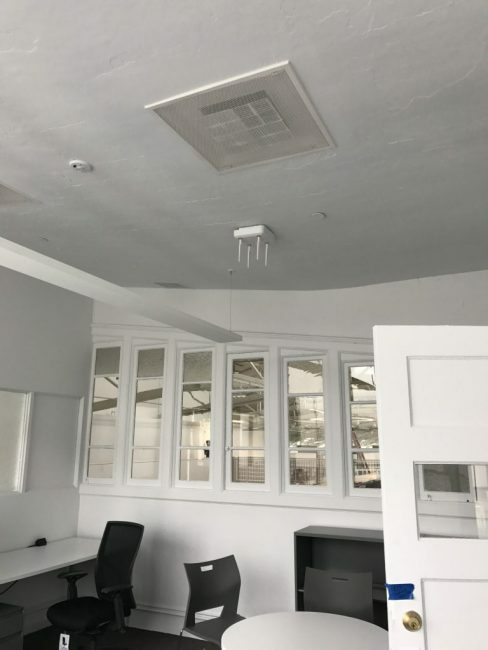 Packet6 helped to augment the existing IT team to provide a reliable network within weeks of the grand opening of the Fort Mason campus. SFAI’s goal was to provide a fast frictionless Wi-Fi network to the students, staff, faculty, and visitors. Coverage throughout the campus was a must and more importantly, capacity. SFAI decided to go with the Cisco 3802 access points. The 3802 access point upgraded their network to 802.11ac. A significant upgrade from their 802.11a/b/g Wi-Fi network. A total of 31 Cisco 3802 802.11ac dual band access points were purchased, mounted, and wired throughout the campus. 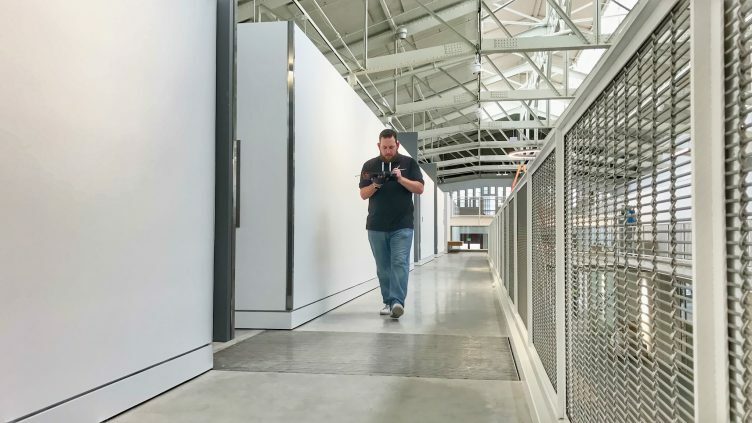 Powered by a stack of Catalyst 3850 switches and protected by a Cisco ASA firewall, Packet6 configured the switches, firewalls, configured the Mobility Express controllers, and created secure tunnels back to SFAI’s main campus. Initially, the Cisco Converged Wireless was a selected solution. Packet6 made the recommendation to migrate away from Converged Wireless and into an updated and supported platform, Cisco Mobility Express. A pair of the Cisco 3802 access points were converted to primary and standby virtual controllers to manage the other access points. 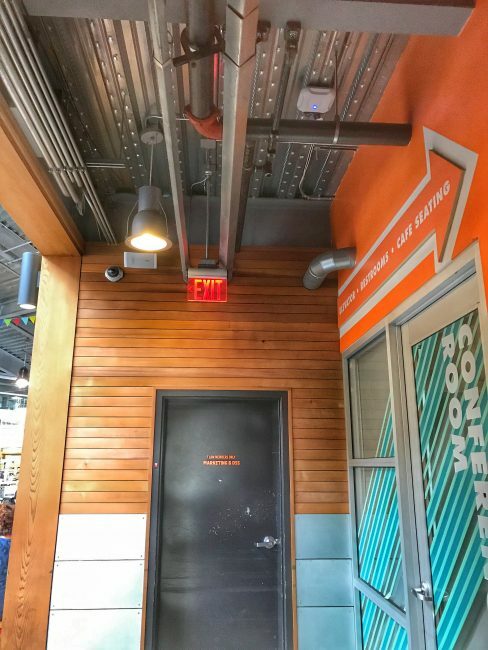 The location of each access point were predetermined and wired by the building architect. Packet6 utilized these locations and produced a predictive site survey to help visualize what the Wi-Fi network could look like with the Cisco 3802 access points. After the access points were mounted and powered on, Packet6 configured the access points via the virtual controllers according to the RF plan Packet6 designed. A validation site survey was performed to produce a report confirming proper operation and consequently successfully closing out the project. 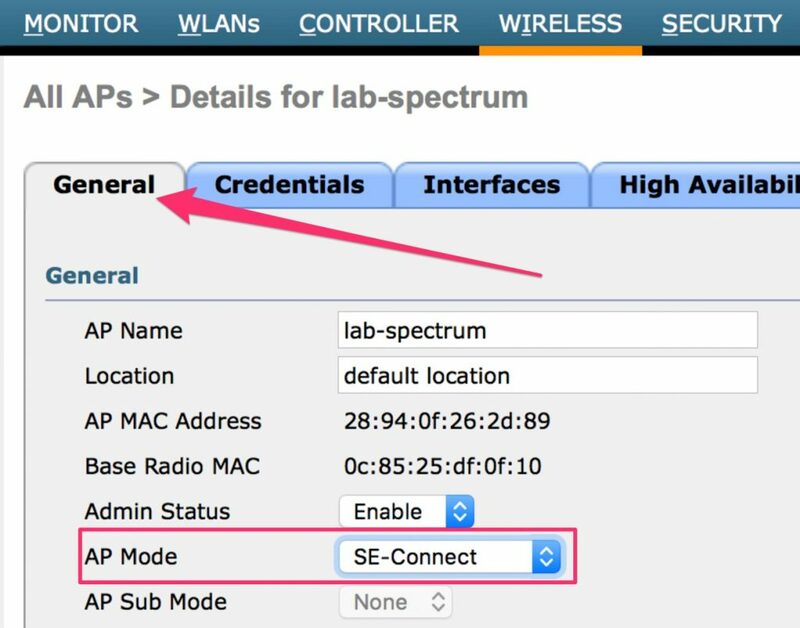 Learn how to use Chanalyzer for spectrum analysis with Cisco CleanAir APs to gather the spectrum data. 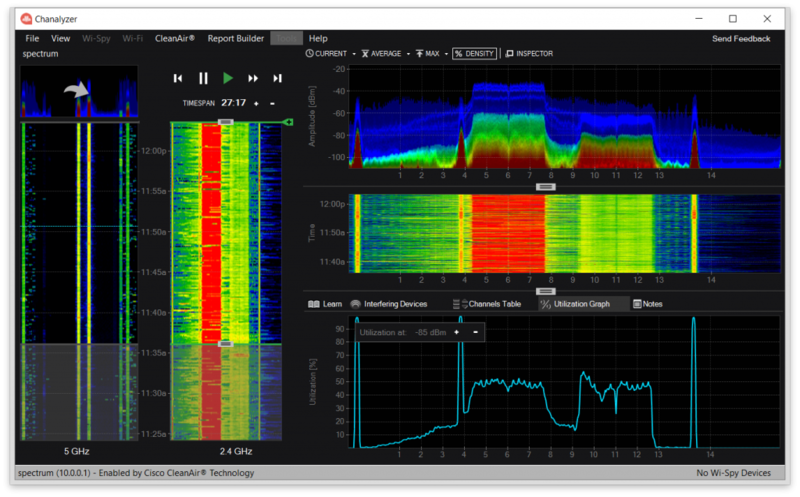 One of my favorite things about Wi-Fi is visualizing the invisible with a spectrum analyzer. I like to use Metageek’s Chanalyzer to do this. But you need to have the dBx adapter with you to start seeing the spectrum. Another way to get detailed spectrum data is to use a configured Cisco CleanAir AP. Chanalyzer has an accessory to connect to a CleanAir AP to view this spectrum data. The best part of using a CleanAir AP is being able to do it remotely. That’s right, doing spectrum analysis from your seat several miles, even hundreds of miles, away from the source. Granted, the view of the spectrum is from the APs perspective but it sure beats flying out there. It works great in a pinch. Please Note: Spectrum Expert Connect is not supported on Cisco Aironet 1810 OEAP, 1810W, 1830, 1850, 2800, and 3800 Series APs. The obvious requirement here is CleanAir must be enabled on the AP. 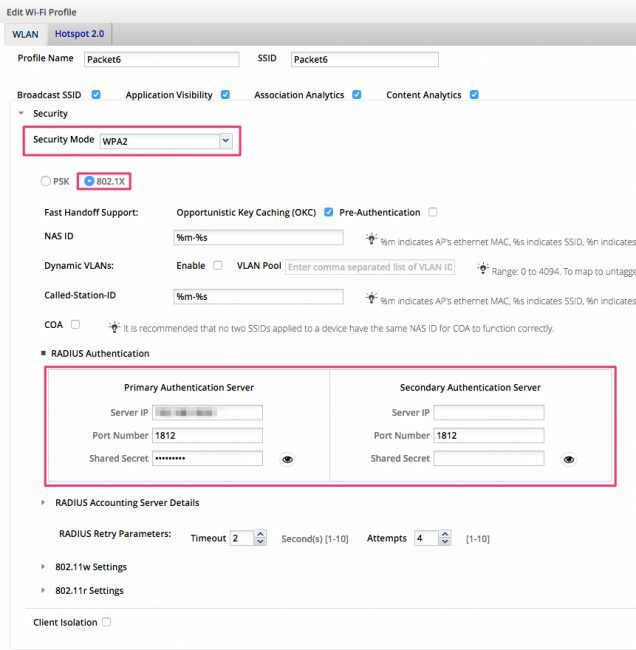 You can connect to an AP that is actively serving clients but you will only be able to see the spectrum from its operating channel. If the AP is serving clients on channel 36, then you will only see the spectrum of that channel. In this post I am using a Cisco Aironet 3502i. You may be familiar with Local mode which tunnels the user traffic back to the controller. This mode only shows you spectrum on the serving channel. Monitor mode will scan for interferers on all channels but will not serve any clients. 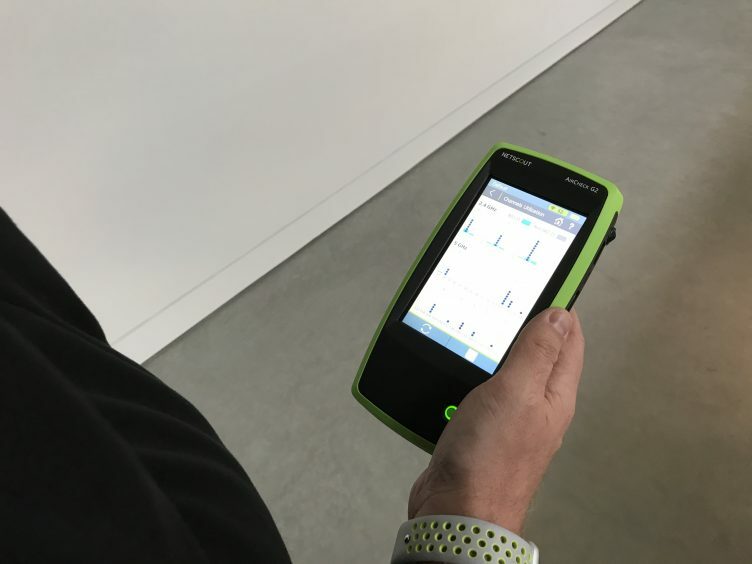 SE-Connect is the mode we want to use to connect Chanalyzer to a CleanAir AP. This mode also doesn’t serve clients but will provide you the spectrum data you seek. From the Monitor page, click on Wireless. From the list of APs, click on the one that will be used for Spectrum Expert. From the General tab of the AP, click the dropdown for AP Mode and select SE-Connect. Click Apply. The AP will reboot into SE-Connect mode. Get coffee. It isn’t kidding about a few minutes. 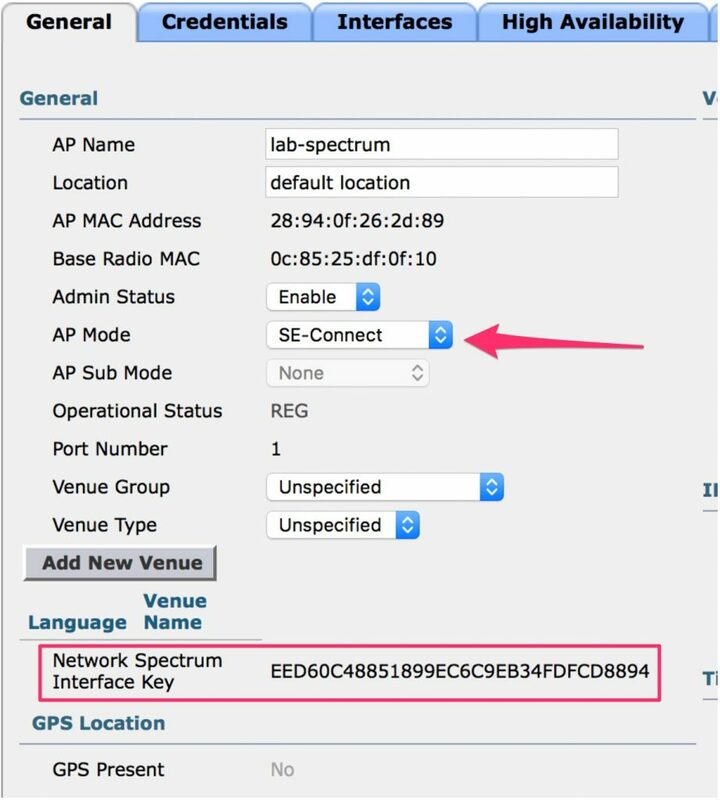 When the AP reconnects to the controller, navigate to the General tab and copy the Network Spectrum Interface (NSI) Key. This will be used to authenticate the AP in Chanalyzer. Please Note: You must have a license to the CleanAir Accessory to connect Chanalyzer to an AP. Click on CleanAir from the top menu and click on Connect to a CleanAir AP. Type in the IP address of the AP, the NSI Key you copied from the Cisco WLC, and give it a name. Then click Connect. Chanalyzer will establish a connection to the Spectrum Expert enabled AP. Once connected you will see the panes populate with colors. Because we are using a Cisco AP in SE-Connect mode, we are able to see a double rainbow. That is both 2.4 GHz and 5 GHz views at the same time. Interferers are detected using Cisco CleanAir signatures. By selecting one of the interferers it will be displayed in the density view pane. Another useful view is the Utilization graph to identify congested channels.